Our second semifinal match in Bracket Seven of Battle of the Books features Quantum Coin by E. C. Myers going up against The Apocalypse Codex by Charles Stross. The book I (Amy) most want to continue reading after 100 pages will reach the championship round. 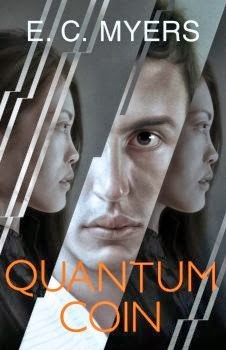 Quantum Coin: Pyr books, October 2012, 331 pages, cover art by Sam Weber. Quantum Coin is the sequel to Fair Coin, which was E. C. Myers' first novel. Quantum Coin reached the second round by defeating The Path of the Fallen by Dan O'Brien and narrowly getting by Clockwork Angels by Kevin J. Anderson. Quantum Coin begins with Ephraim Scott at Senior Prom. Ephraim was waiting for his date, Jena, but when he spotted her, strangely she was no longer wearing her prom dress. Soon he realized that she wasn't Jena at all, but Zoe, an analog of Jena from a parallel universe. Ephraim met Zoe in his earlier adventures. Then Jena returned. Seeing Jena's apparent twin, Zoe, puzzled their friends Nathan and the actual twins Mary and Shelly. They all went somewhere more private so Ephraim and Zoe could explain. Zoe came seeking Ephraim because Nathaniel, a forty-something analog of Nathan who works at the Everett Institute, called for help. After Zoe's arrival, Nathan's video camera began capturing ghostly images of people from parallel universes. Ephraim, Zoe and Jena attempt shifting to Nathaniel's universe, using Zoe's controller and Ephraim's coin, but they are blocked from arriving. Upon returning, Mary and Shelly merged into one girl. Next they successfully shifted to Zoe's universe, where Zoe can communicate with parallel universes via her Korean grandpa's old ham radio. Eventually they make radio contact with Dr. Jena Kim, an older analog of Jena and Zoe, who works with Nathaniel. They are given a narrow time window when they're allowed to shift to the Institute's universe. The Everett Institute is operating on a skeletal staff due to funding problems. Nathaniel shows Ephraim, Zoe and Jena around. He introduces them to Dr. Kim, who is demanding and doesn't inspire their trust. Apparently universes are collapsing together. Dr. Kim believes that the only person who could possibly understand what's wrong is the founder of the Institute, Hugh Everett III (who, in our world, was the physicist who proposed the many-worlds quantum theory), but unfortunately he's dead. After some arguing, it's decided that Ephraim, Nathaniel and Jena will search parallel universes for a suitable analog of Dr. Everett. Zoe will stay and keep an eye on Dr. Kim. The Apocalypse Codex: Ace Books hardcover, July 2012, 255 pages, cover art by Mark Fredrickson. Charles Stross is a well-known Scottish science fiction author, who has written around twenty books. The Apocalypse Codex is the fourth book in his Laundry Files series. The Apocalypse Codex reached the semifinals by defeating Free Radicals by Zeke Teflon and getting by Apollo's Outcasts by Allen Steele. 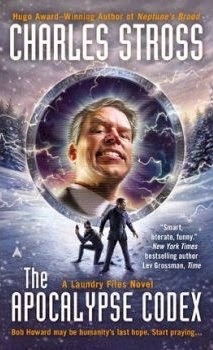 Bob Howard is a computational demonologist working for an ultra-secret agency of the British government called the Laundry, which defends the realm from occult threats. HR sent Bob to a management training class for the regular civil service. At a bar, Bob met Gerald Lockhart, a higher up in the Laundry, who Bob will be assigned to for a project. Gerald Lockhart heads a small department called Externalities. Lockhart contacted private intelligence agent and witch Persephone Hazard. Persephone Hazard and her assistant Johnny McTavish were introduced in the first chapter, which told of a caper in which they carefully broke into Schloss Neuschwanstein, the castle which inspired Disneyland's Castle, and replaced a displayed forgery with the real occult amulet. Also Bob reads Ms. Hazard's dossier. The Laundry has concerns about the Golden Promise Ministries of American televangelist Raymond Schiller. Their investigation of the televangelist unfortunately encountered ties with the Prime Minister's office, where the British Secret Service is forbidden to snoop. Persephone Hazard (aka BASHFUL INCENDIARY) is an external contractor with no such restriction. It'll be Bob Howard's job to monitor Ms. Hazard and Mr. McTavish's investigational activities, but not to direct them. Bob needs to be prepared for any eventuality. Lockhart takes Bob to MI5 to get a new passport with a diplomatic visa, and to another office to be issued temporary tattoos that can be used as communication devices. Bob also gets a gadget that looks like a compact camera, but with a special SD card it becomes a SCORRPION STARE gun which can turn things to stone. Meanwhile, the televangelist Raymond Schiller has breakfast with the Prime Minister and some senior ministers and industry leaders. Schiller is using a glamour to gain influence over others. After the meeting, we learn that Schiller's Golden Promise Ministries are unexpectedly researching brain neurochemistry. The Battle: This match-up has a YA science fiction book featuring parallel universes going up against an occult science fiction British spy thriller. In Quantum Coin, I appreciated the distinctly different personalities of Jena and Zoe, the analogs who looked like twins. I liked that Jena was reading books that don't exist in our universe, such as Jane Austen's unfinished Sandition. The uncomfortable situation of Ephraim traveling with his girlfriend and an analog of his girlfriend who's his friend, was humorous. Ephraim was understandably unsettled that his analog in the Institute's universe is presumably dead. I think Quantum Coin started fairly fast, with Zoe's unexpected arrival from her parallel universe, even with the information imparted about their gizmos. But the next fifty pages, shifting to the Everett Institute, in my opinion couldn't quite maintain that fast pace. There didn't seem to be the sense of urgency I expected about parallel universes collapsing at the Institute. On the other hand, The Apocalypse Codex is chugging along. The first 100 pages seems to be all set-up and outfitting for action. We learn about Bob's secret agency office job, his bosses, and about some rules of operation at the Laundry. Bob is introduced to the external contractors on the project. There are enough otherworldly details, such as Bob signing official documents in blood, to make this a fantasy, and not a spy thriller. The author's wit and sarcasm keep this readable. No clear evil plot or threat is evident yet, but trouble is foreshadowed. At nearly page 100, some creepy stuff about televangelist Schiller was revealed. "Ninety-eight percent of management work in this organization is routine. The other two percent is a tightrope walk over an erupting volcano without a safety net. Congratulations: here’s your balance pole." Both these books are entertaining. I'd like to, and plan to, continue reading both of them. But for Battle of the Books I need to pick which book I'd rather continue reading after only 100 pages. Parallel universes are cool, and I liked the characters in Quantum Coin. But I'm more curious about what the heck will happen next in The Apocalypse Codex. The Apocalypse Codex advances to the championship round to face The Rise of Ransom City by Felix Gilman.